A few months ago we began to build a house for a single mom in Tricotte. She had been living in very poor conditions and had no means of bettering her living situation. When Glenn and I, along with a team of four from First Reformed Church in Lynden, arrived in Haiti last Friday, the walls were up and the house was ready for a roof. The team proceeded to measure the project, then built the trusses on Saturday, installed the trusses and purlins on Monday and screwed down the metal roofing on Tuesday. Today this needy lady has a good roof over her head – she is so appreciative. Every time I come by she hugs me, and I pass those hugs on to you. Today our director Daniel and I went to Beaudois to visit the older couple we wrote about a few months ago. The husband is physically disabled and hasn’t walked for several years. With your help we were able to build them a small house to get them out of a mud hut with a dirt floor and a thatch roof that leaked badly. The finishing touches are going on the house and they will be moving in later this week. We thank God for the opportunity to minister in this way to this Christian couple. They can’t believe that anyone would support them this way, and this has been a great testimony to the villagers in that area. We trust this home will be seen in the village as an example of Christ’s love, and that God will use it to glorify Himself and draw others. We left Beaudois and drove to Nan Paul where we just finished a small house for Examen. He is the begging blind man that Daniel and Glenn rescued a few months ago. We wrote about Examen in our October newsletter. At that time I had written that Examen was not a Christian. However, he had actually been a Christian for a long time. He was very discouraged that the Christians in his area didn’t seem to care about him. With no one to help him, he had to resort to begging, and in his discouragement he had fallen away. Now Examen has come back to the Lord and is testifying of the goodness of God. 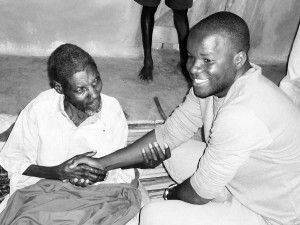 When Daniel and I stepped into his house, Exame took hold of Daniel’s hand and would not let go. He thanked him over and over again for helping him. And more importantly he was praising God for sending Daniel and Glenn to reach out a helping hand. And then he told Daniel that he prays for him and his ministry every day. What a tremendous thing to see how God has restored this virtually helpless man and now is using him to pray for and encourage others. And as we left he asked Daniel to please remember his nephew and help him – not thinking of himself and complaining of his condition but thinking of another needy relative. We thank God for Daniel and his heart for the most needy and helpless of Haiti! Joline, the young girl with serious burn scars that prevent her from walking without crutches, now has an appointment to see a team of surgeons on Monday, April 2. Please continue to pray for her and the doctors as they determine what course of surgery they will follow. The surgeons hope to be able to begin the process of possibly a series of several surgeries. Thank you for continuing to pray for Joline, the surgeons, and an outcome that will allow Joline to walk freely. Glenn is working hard on the medical clinic project. At lunch today he said he has 18 Haitian workers on the job. Some are carrying sand and gravel, with wheelbarrows and with saddlebags on motorcycles. He had some working on excavation for the foundation. Still others were helping him finish off the sewer line for the orphanage/clinic septic system. Glenn is really pleased with the progress. The local people are often seen at the sight, excitedly talking about the answer to years of praying. Please continue to pray for this part of our ministry as well. We really see this as a great opportunity to share Jesus with those who don’t know Him. Again we thank you for your prayers and support. God is faithfully using you to accomplish much for His kingdom.